The Young and the Restless (Y&R) spoilers for Tuesday, May 8, tease that Sharon (Sharon Case) and Nick (Joshua Morrow) will hit the sheets. They’ll make love multiple times throughout the episode, so it’s clear they’ll enjoy their reconnection. However, Nick won’t be prepared to make a real commitment yet. It hasn’t been that long since Chelsea (Melissa Claire Egan) broke his heart. Sharon will suggest she’s fine with that. They’ll settle on being friends with benefits, so we’ll see how long it works out for them. At the ranch, Victor (Eric Braeden) and Neil (Kristoff St. John) will discuss publicity plans, Dina’s (Marla Adams) screening and Devon’s (Bryton James) impending bundle of joy. As they chat about fathers and sons, Victor will note that Jack (Peter Bergman) can never be John (Jerry Douglas). Over at the Abbott mansion, Dina will revert to childhood in a tough episode. Ashley (Eileen Davidson) will wonder if they should just scrap the screening idea. Jack will agree that might be for the best, but Dina won’t stand for it. She’ll come back to reality, so they’ll stick with the plan. At the athletic club, Billy (Jason Thompson) will fume when Kyle’s (Michael Mealor) late for a meeting. He’ll have to make a deal with the client on his own. After Kyle finally struts in, they’ll discuss Dina’s big night. Kyle will insist that he wants to be part of the Abbott family gathering. Over with Cane (Daniel Goddard) and Lily (Christel Khalil), they’ll beam with pride over Charlie’s (Noah Alexander Gerry) film. The teen will track them down later and suggest he just wants everything to go according to plan. Too bad Y&R fans know it won’t! Cane, Lily and Charlie will all be in attendance for the shocker ahead. After Kyle joins the rest of the group, Jack will give him John’s cufflinks as a present. Kyle will naturally seem glum and a bit uncomfortable. Once everyone makes it to the theater, Jack will give a sweet speech about Dina and the Abbott clan. He’ll be ready to start the film when Victor arrives. Neil will admit he filled Victor in on the event. Jack will try to turn Victor away, but Dina will want him there as her special guest. The Young and the Restless spoilers say Jack will just try to deal with it. When the film begins, the crowd will seem pleased. Unfortunately, chaos will hit after an unexpected clip appears. Dina will talk about her affairs and reveal that Jack isn’t John’s son! 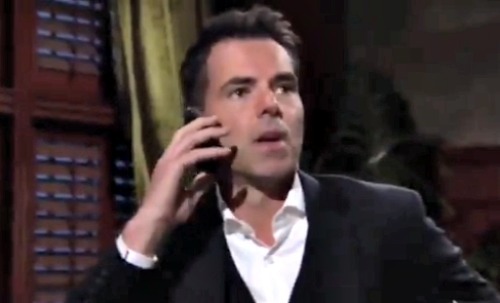 The Young and the Restless spoilers say Jack will be stunned by the huge revelation. Meanwhile, Victor will look awfully satisfied nearby. Is he to blame for this ruined night? We’ll give you updates as other Y&R news comes in. Stick with the CBS soap and don’t forget to check CDL often for the latest Young and the Restless spoilers, updates, and news.